Welcome to the Village By the Gulf! 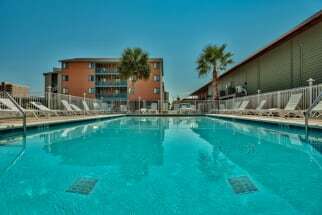 Village by the Gulf condo rentals are located in the gorgeous Gulf Shores Alabama! You will not be disappointed with all Gulf Shores has to offer while you're on your visit. From the crystal white beaches and sky blue waters to all the attractions available, you'll never get bored! Village by the Gulf is directly across the beach! It comes with a fully stocked kitchen and a washer and dryer inside! It also has 2-3 bedrooms and 2-3 baths. There is an outdoor swimming pool a putt-putt and basketball area, also a children's play area and covered pavilion. Not only is the condo a wonderful place to be, but so is Gulf Shores. Gulf Shores offers many things for you and the whole family to enjoy, such as the Alabama Gulf Coast Zoo, Waterville USA, deep sea fishing and many, many more! Don't forget to stop for a bite to eat at many of the local restaurants in the Gulf Shores area! At Emerald Coast by Owner we help you find the best vacation rental, and location for you! Take a look at the properties below and contact the property owners directly with any questions, they will gladly assist you in the booking process. Booking direct with the property owners is the best way to ensure you are getting the lowest price possible for your vacation rental. Book online today with emeraldcoastbyowner.com.